I'm becoming a pro at photographing brown food, don'tcha think? Anyway, it's super simple, like Sunday suppers of yore. I grew up with a mish-mash of lucky New Year's foods, with pork and sauerkraut from Mom's family and black-eyed peas from the African American neighbors who helped nurture me when I was very young. From what I've read, this is eaten on New Year's Eve in Germany, but on New Year's Day in German American communities. The Lancaster County, Pennsylvania news website has a nice long list of church and fire hall fundraisers where you can get your good luck meal, but those of us in other parts of the country will need to make our own luck 😊. This should make about 6 servings and take about an hour total. The apple will balance the salty sour cabbage and make for a lovely yet simple meal. 2 c liquid: dry white wine, beer, broth or water. I used water with 1/4 c white wine vinegar. Sprinkle a generous amount of salt, pepper and granulated garlic over the pork loin. If you can, do this a few hours or a day ahead. Turn on the saute or brown function on your electric pressure cooker. Add oil and butter. Let it heat up until it's hot enough for searing--you don't want to put the meat in too early because the piece is pretty big, and the temperature will drop too much for good browning if you do. Let pork sit and brown for at least 5 minutes before you try to turn it to brown the other sides. If it sticks when you try to lift it, leave it until it releases easily. In the meantime, mince the onion or shallot (tiny bits) and dice the apple (small cubes). Drain the sauerkraut. If you're very salt-sensitive or don't care for the flavor much, you can also rinse it. When the pork is browned on all sides, remove it from the pot and toss in the onion or shallots. Stir. Once the onion/shallots are soft (just a couple of minutes), add the liquid and use a wooden spoon or silicone spatula to scrape up the yummy brown stuff from the bottom. Stir for another minute. 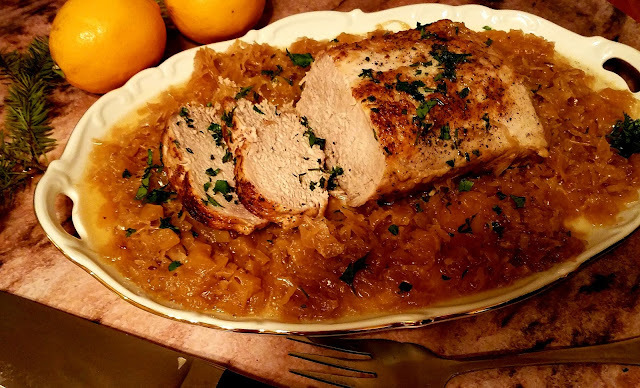 Add apples and kraut to the pot and lay the pork loin on top. Lock the lid and set the cooker on high for 15-20 minutes (I did 20 and it was a bit dry, but if your loin is over 2.5 lbs you might want to err on that side. Next year I try 15 and update). Once the pressure cooker has finished coming to pressure and cooking, allow 10 minutes of natural release time before you release the rest of the pressure. CAREFULLY release what's left in there and remove the pork and kraut from the pot. Serve over your mash of choice: cauliflower, white bean, or (non-AH) potatoes. Enjoy the good luck all year! For my new AH readers, this recipe is a definite "field trip" away from how I'm currently eating. However, I'm now much choosier about those things, and I made the choice to try out this recipe from the family annals because it was so important to my grandparents. My Grandma Irene used to come and visit us in the Philadelphia area around the holidays, or in May when the azaleas were in bloom. 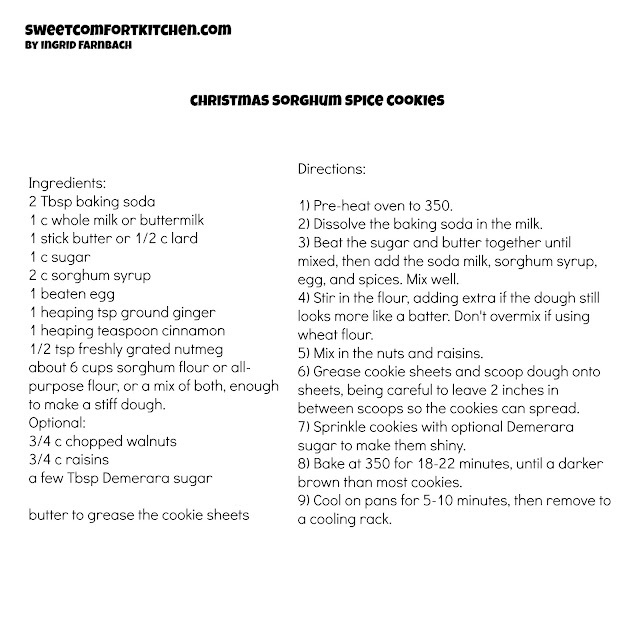 If it was a holiday visit, she was sure to be in the kitchen working on her stollen, but I also remember that sorghum cookies were very important to her. I didn't really understand why, but now I know that they were one of her remaining connections to my Grandpa Fred, who had passed away when I was just five. The ones on the right are underbaked. Make sure they get a nice deep golden brown. Grandpa's family was made up of the Sevier side, which had come over and fought in the Revolutionary War, and the Farnbach side, which had had to flee Bavaria in order to avoid being arrested for poaching on the king's lands. Branches of both families landed in Calhoun County, Illinois, a very rural area that was very Southern in many ways. Sorghum syrup, made from a grain but tasting like a mild molasses, was very common and inexpensive there. Grandma couldn't find it in Philadelphia or Phoenix, where she lived, so what we usually had were actually molasses cookies. 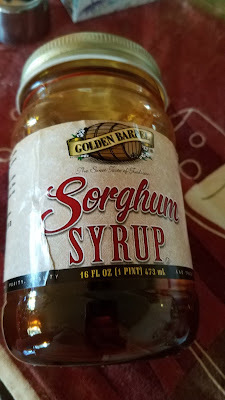 Molasses is a perfectly fine substitute, but thanks to a friend who had been in Indiana on business and Amazon Prime, I was able to get my hands on sorghum syrup pretty quickly. 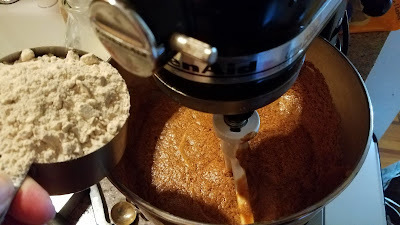 It turns out that sorghum flour is also gaining in popularity because it's gluten-free, so I decided to use that as well. My first attempt was a flop, since I didn't realize I'd have to add more flour to keep it from being too cakey. 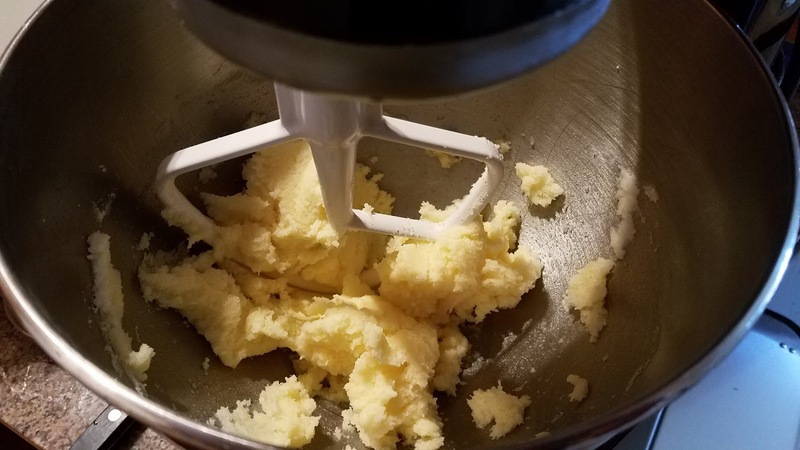 My second attempt is a success, and an adaptation of one of the amazing recipes my uncle rescued from Grandma's copy of a book of recipes from the kitchens of Calhoun County. I pared it down considerably, as the original recipe starts with a HALF GALLON of syrup (directions include "mix in a dish tub"), and needless to say would have made more cookies than my little city kitchen could handle. 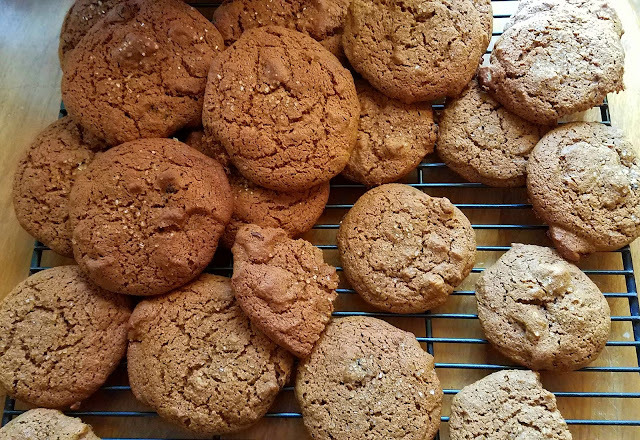 It still makes about 4-5 dozen cookies, and they get better as they age. 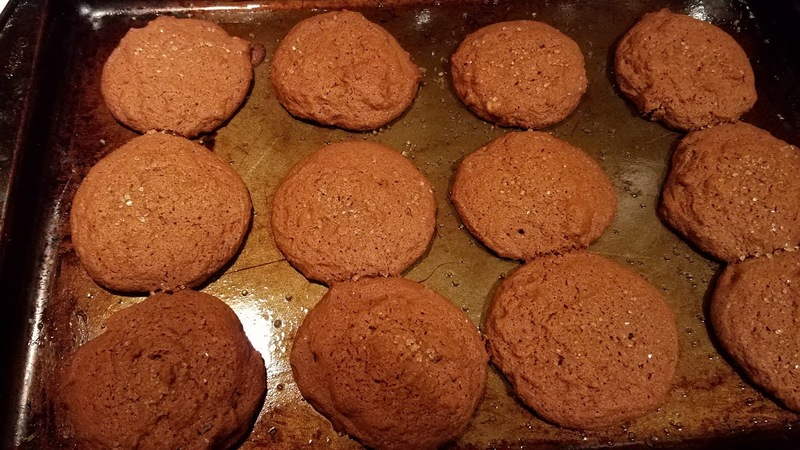 This recipe has more liquid and less fat than most modern cookie recipes, and calls for a lot more sorghum than any other recipe I found online. First, take out 1 stick of butter to soften and preheat the oven to 350. 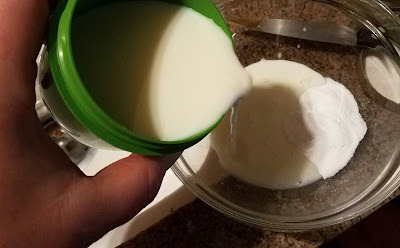 Stir 2 Tbsp baking soda (yeah, it sounds like a lot, but it works) into 1 cup of whole milk or buttermilk until dissolved. Mix the stick of butter and 1 cup granulated sugar. It won't look lovely and creamed like when you make other cookies, you just want to get it in evenly. Add 2 c sorghum syrup, 1 beaten egg, the milk with the soda in it, 1 heaping tsp each ginger and cinnamon, and 1/2 heaping tsp nutmeg (preferably freshly grated). Mix well. Start adding in 6 cups sorghum or all-purpose flour on very low speed, 1 cup at a time. Hold a dish towel around the bowl if the flour starts flying out. The original old-school recipe doesn't say how much, just "until you have a stiff dough." My aunt Rosalie took one for the team and measured about 24 cups for the original giant recipe! It must have been to make enough for the whole parish or something. Stir in 3/4 cup each of raisins and chopped walnuts. The original recipe didn't use this much proportionally, as these were very special expensive ingredients back in the day. 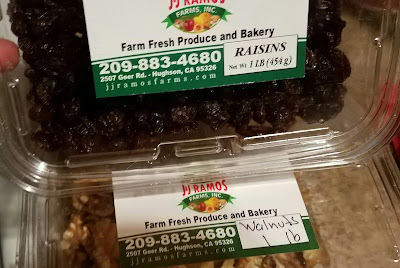 I found these really delicious and inexpensive ones at the winter farmers' market on my way to work. Almost as fresh as if I had cracked them myself like the ladies of Calhoun County would have done. 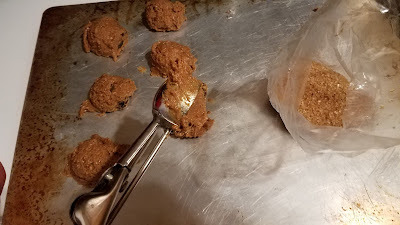 Scoop the dough onto a greased cookie sheet--I still use butter as I don't care for the taste of cooking sprays. Sprinkle with Demerara sugar if you can find it. A good bulk section can be your friend for this ingredient. This sugar was $5.99 a pound in the baking aisle and $1.99 a pound in bulk. Bake at 350 for 18-22 minutes. You'll want to let them get nice and brown so they aren't too soft because of the low fat content. 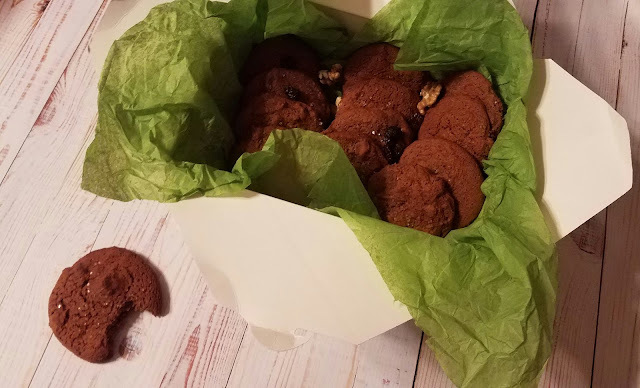 I usually pull cookies sooner because I like chocolate chip and oatmeal cookies soft, but that doesn't work as well here. They taste good the first day, but they taste GREAT the next day and age well in an airtight container. I hope you try them and enjoy them! Should be 4-5 dozen cookies depending on the size of your scoop.